Alejandra Camacho and Aurora Chavez at Machu Picchu in Peru. Since 2007, 25 students have traveled to Cuzco each summer for the Cal Poly in Peru study abroad program. As part of the program’s community service component, students install clean-burning cookstoves in indigenous communities. 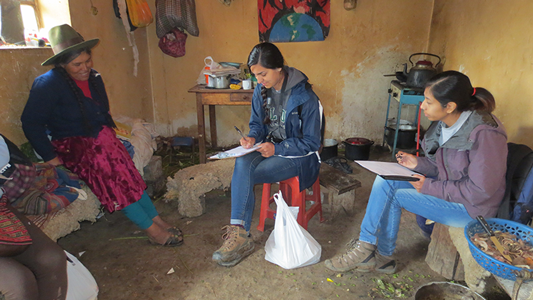 Cal Poly Geography Professor James Keese and students Alejandra Camacho (Anthropology and Geography) and Aurora Chavez (Political Science) traveled to Peru in March to conduct a follow-up study on the stove project. Working in partnership with the non-governmental organization Proworld Service Corps, the stove project addresses the global health problem of indoor air pollution. In the seemingly innocent act of cooking meals, Peruvians are exposed to the dangers of smoke emissions from antiquated stoves that use open fires inside their homes. To remedy these problems and provide an international educational experience for Cal Poly students, Keese created the summer quarter Cal Poly in Peru Program. In addition to studying language and culture, students install improved stoves in rural households, giving them the opportunity to learn about the rewards of community service. with a local in Peru. In March 2015, Camacho and Chavez accompanied Keese to Peru to determine the long-term adoption rate and the extent the new stoves were helping the community. The team surveyed 43 families in three communities where Cal Poly students had installed the new stoves. As Camacho and Chavez learned about the stoves’ retention rate, they also learned more about the local culture and how to communicate. 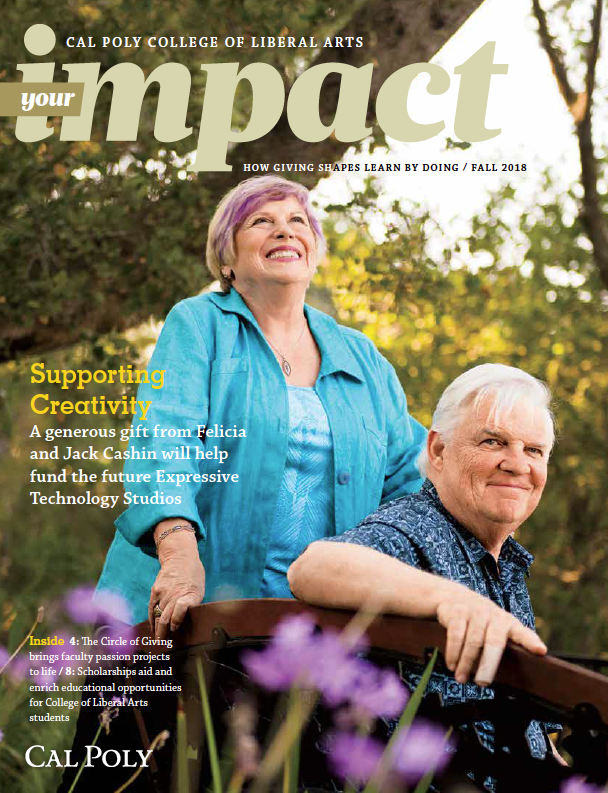 “A lot of the time, the families spoke Quechua (the native language), so we would have a translator translate their answers into Spanish, and we would then translate them into English,” Camacho said. Keese, Camacho and Chavez found a 70 percent adoption rate for new stoves installed during the past four years. This is greater than the 30-50 percent adoption rates in many stove programs across the globe. They were able to identify several factors that contributed to the positive outcome with the new stoves: ease of use, low fuel consumption, ability to burn a variety of local materials (wood, manure, crop residues), and, most importantly, the stove fit the cultural context. James Keese, at the California Geographical Society conference. 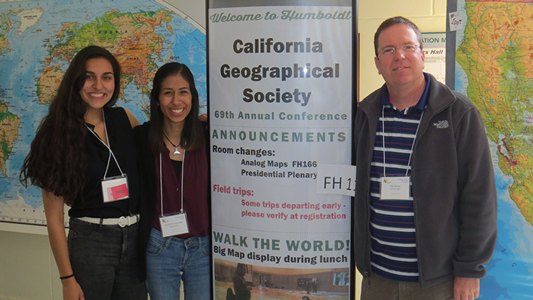 Camacho and Chavez presented the study results at the California Geographical Society conference on May 2 at Humboldt State University. The team co-authored an article which was recently submitted to Development in Practice, a peer-reviewed publication focusing on international development issues. Camacho and Chavez are also preparing a report for Proworld in Peru, offering recommendations for further improving the stove project and the efforts of future Cal Poly students who will work on this project. For more information on the Cal Poly in Peru study abroad program, visit the Study Abroad website.